To understand falls self efficacy. To refer those reporting fear of falling for rehabilitation interventions. Falls self-efficacy: beliefs in one’s capabilities to organize and execute the courses of action required to produce a given attainment. In the area of fear of falling, self-efficacy has been studied with respect to falls self-efficacy, which refers to personal beliefs in one’s ability to engage in certain activities of daily living without falling or losing balance. Fear of falling is a complex area. It is unclear exactly what exactly causes fear of falling. It relates very much to a person own belief in their ability to perform a task safely, whether they feel they will lose their balance or actually fall. There is a focus on having confidence to do something but there is also the anxiety associated with it when people get the physical sensations associated with fear eg. nausea and palpitations. It’s a vicious cycle then when you see the person become increasingly more fearful. Fear of falling syndrome: a fall leads to a fear of falling which leads to cautious gait increasing the risk of falling (a vicious cycle). More common in those who have fallen and in frail older adults. Which comes first: the fear or the fall? 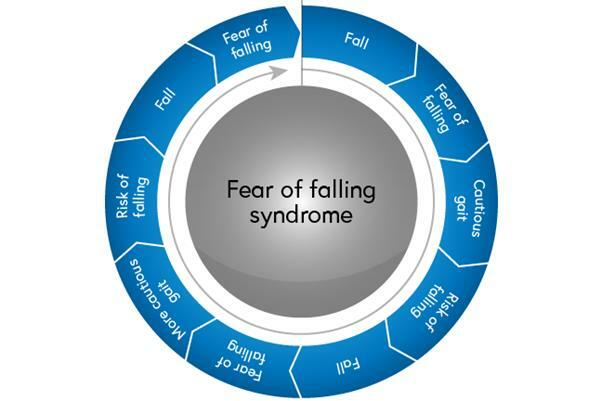 A study in 2002 showed that falls at baseline were an independent predictor of developing fear of falling 20 months later (odds ratio (OR) = 1.75; P < .0005), and fear of falling at baseline was a predictor of falling at 20 months (OR = 1.79; P < .0005). 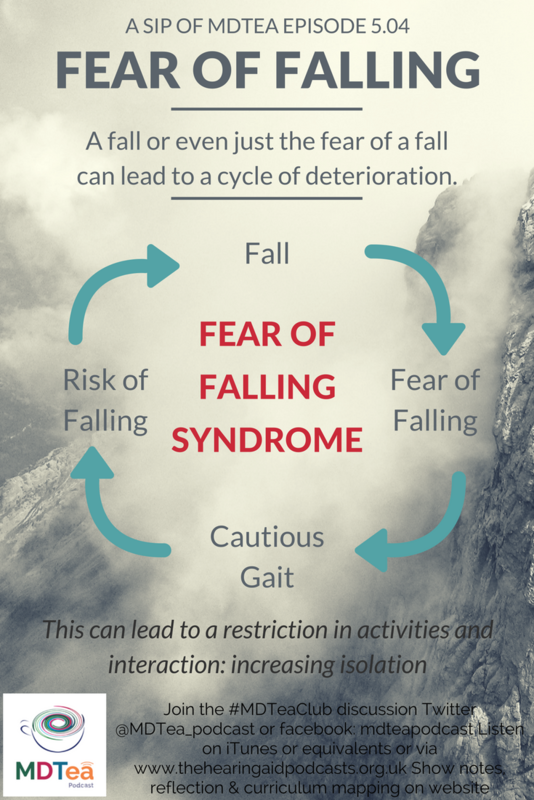 42% of non-fallers reported fear of falling that restricted their activity at baseline. When present, reduced physical activity and cautious gait are likely to develop. This is counterproductive and leads to reduced balance and strength which then increases the risk of falls. They also found that women with a history of stroke were at risk of falls and fear of falling at follow-up. In addition, Parkinson’s disease, comorbidity, and white race predicted falls, whereas General Health Questionnaire score, age, and taking four or more medications predicted fear of falling. 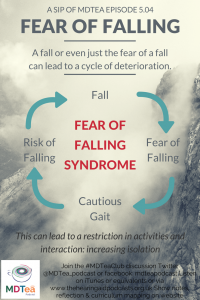 Fear of falling might be useful in some cases… If an individual has some concerns about falling, this might be totally appropriate if they do have falls risk factors. The problem is when the fear of falling stops the individual from doing something they are capable of doing. Most studies currently exclude participants with dementia even though this group of patients have an increased risk of falls. Most of the studies have falls rate as the primary outcome with fear of falling/self efficacy as a secondary measure. The cognitive behavioural therapy studies are interesting to discuss and as health care professionals we can use some of these techniques within our scope of practice. A couple of systematic reviews now (2007,2012) that looked at interventions for preventing falls in older people living in the community. Earlier review (2007) findings: Limited but fairly consistent findings in trials of higher methodological quality showed that home-based exercise and fall-related multifactorial programs and community-based tai chi delivered in group format have been effective in reducing fear of falling in community-living older people. Cochrane review specifically on fear of falling found that there was insufficient evidence to determine whether benefits are seen beyond the end of exercise regimen and that further research is required in this area. Found 30 studies, only 9 could be included. Evidence of reducing falls but insufficient data on other outcomes like depression, anxiety and limitation of physical activity. Group and home-based exercise programmes, usually containing some balance and strength training exercises, effectively reduced falls, as did Tai Chi. Overall, exercise programmes aimed at reducing falls appear to reduce fractures. Link to summary podcast of this review. Interventions to improve home safety appear to be effective, especially in people at higher risk of falling and when carried out by occupational therapists. Targeting specific concerns may be helpful for example: anti-slip shoe device worn in icy conditions can also reduce falls. Age UK have produced a lovely resource pulling the evidence together for reducing falls, broken down into type, duration and intensity. Exercise programmes need to include resistance training, and exercising in standing, making the point that although chair based programmes have their place that falls prevention can’t be achieved by this alone. It is also worth remembering that although exercises may be similar for primary prevention (preventing first falls) and secondary prevention (preventing further falls) secondary prevention programmes will need more support and possibly a more individualised approach. Frequency should be at least 3 times a week so if a person is only being offered a weekly class then home exercises need to be prescribed. Pg 11 of this document gives a nice table breaking down different exercise interventions. A reminder of the benefits of community based falls programmes, see episode in series 2, episode 9. Vision and foot health episodes too! Central London Community Healthcare created a Fear of Falling leaflet for patients.